This article is about the person. For the company, see Harry Winston, Inc.
Harry Winston (March 1, 1896 – December 28, 1978) was an American jeweler. He donated the Hope Diamond to the Smithsonian Institution in 1958 after owning it for a decade. He also traded the Portuguese Diamond to the Smithsonian in 1963. Winston founded the Harry Winston Inc. in New York City in 1932. He had been called by many as the "King of Diamonds". Winston's father Jacob started a small jewelry business after he and his mother immigrated to the United States from Ukraine. While growing up, he worked in his father's shop. When he was twelve years old, he recognized a two-carat emerald in a pawn shop, bought it for 25 cents, and sold it two days later for $800. Winston started his business in 1920 and opened his first store in New York City in 1932. Winston's jewelry empire began in 1926, with his acquisition of Arabella Huntington's jewelry collection, for $1.2 million. The wife of railroad magnate Henry E. Huntington, Arabella amassed one of the world's most prestigious collections of jewelry, largely from Parisian jewelers such as Cartier. When Winston bought the collection after her death, the designs of the jewelry in the collection were quite old fashioned. Winston redesigned the jewelry into more contemporary styles and showcased his unique skill at jewelry crafting. According to the Huntington museum, "He frequently boasted that Arabella's famous necklace of pearls now adorned the necks of at least two dozen women around the world." When he died, Winston left the company to his two sons, Ronald and Bruce, who then entered into a decade-long battle over the control of the company. In 2000, Ronald along with new business partner, Fenway Partners, bought Bruce out from the company for $54.1 million. Winston was among the most noted jewelers in the world, well-known to the general public. In the 1953 musical film Gentlemen Prefer Blondes, the song "Diamonds Are a Girl's Best Friend" includes the spoken interjection "Talk to me, Harry Winston, tell me all about it!" The Lauren Weisberger comic novel, Chasing Harry Winston, was published in May 2008. In 2015, Harry Winston, Inc. operated 39 salons and numerous retail affiliates in locations such as New York, Beverly Hills, Las Vegas, Dallas, Honolulu, Bal Harbour, Chicago, Costa Mesa, and other countries around the world. The Arcots, first 33.70 and 23.65 carats (6.740 and 4.730 g; 0.2377 and 0.1668 oz), recut by Winston to 31.01 and 18.85 carats (6.202 and 3.770 g; 0.2188 and 0.1330 oz), respectively. Originally the stones were thought to be a match, but when Winston bought them, removed them from their settings and discovered they were not, he decided to recut them slightly to improve their clarity and brilliance. Both were either colorless or near-colorless, and antique pear-shaped brilliants. The Anastasia, three emerald cuts weighing 42.95, 30.90 and 22.88 carats (8.590, 6.180 and 4.576 g; 0.3030, 0.2180 and 0.1614 oz), all D color and Flawless clarity. Cut from a rough crystal weighing 307.30 carats (61.460 g; 2.1679 oz) Winston had purchased in 1972, largest gem named after Anastasia Nikolaevna, daughter of Czar Nicholas II. The Ashoka, originally a 42.47 carats (8.494 g; 0.2996 oz), colorless, modified elongated cushion brilliant. Purchased by Winston from a Chinese dealer in 1947; subsequently sold and repurchased several times by the firm. Stone was recut slightly in 1977 from its original weight of 42.47 carats (8.494 g; 0.2996 oz) before it was sold again as a ring. The Blue Heart, a 30.82 carats (6.164 g; 0.2174 oz), blue, heart-shaped brilliant. After the cut was made, Cartier sold it to the Unzue family of Argentina in 1910. It reappeared in Paris in 1953 where it was purchased by an important European titled family, then purchased by Harry Winston in 1959. Winston mounted it in a ring and sold it to Marjorie Merriweather Post, who later donated it to the Smithsonian Institution. The Briolette of India, a 90.38 carats (18.076 g; 0.6376 oz), colorless, briolette cut. The Cornflower Blue, 31.93 carats (6.386 g; 0.2253 oz) pear brilliant; 12.39 carats (2.478 g; 0.0874 oz) round brilliant, blue, cut from 158 carats (31.6 g; 1.11 oz) South African rough which Winston purchased in 1958. The larger stone was sold in 1969 as the pendant for a diamond necklace. Winston repurchased it two years later, then sold it to a Middle Eastern client. The round brilliant was set as a ring and sold in 1969. In 1987 the pear brilliant was auctioned in Geneva, Switzerland. The Countess Széchényi , a 62.05 carats (12.410 g; 0.4377 oz), D color, pear-shaped brilliant. Purchased by Winston in 1959 from namesake and recut to a flawless 59.38 carats (11.876 g; 0.4189 oz). Sold to an American industrialist in 1966. The Crown of Charlemagne , a 37.05 carats (7.410 g; 0.2614 oz), sky blue, Old European cut brilliant. The Deal Sweetener, a 45.31 carats (9.062 g; 0.3197 oz) diamond plus four smaller stones, D color and Flawless, emerald cut. In 1974 Winston bought a large parcel of diamonds worth $24,500,000—at that time the largest individual sale of diamonds in history. Harry Oppenheimer, head of De Beers Consolidated Mines Ltd., arranged the transaction. When Winston asked Oppenheimer, "How about a little something to sweeten the deal?" Harry Oppenheimer pulled a 181 carats (36.2 g; 1.28 oz) rough diamond out of his pocket and rolled it across the table. Winston picked up the stone, smiled, and said simply, "Thanks." It was cut into five gems, the largest being named the Deal Sweetener. Other gems cut from the crystal: An emerald cut of 24.67 carats (4.934 g; 0.1740 oz), plus three pear shapes of 10.80, 4.19 and 1.45 carats (0.290 g; 0.0102 oz), respectively. All were sold that same year. The Deepdene, a 104.52 carats (20.904 g; 0.7374 oz), yellow, antique cushion brilliant. Purchased by Winston in 1954 from Cary W. Bok, then sold the following year to Mrs. Eleanor Loder of Canada. Resurfaced in 1971 and put up for auction at Christie's in Geneva. This stone is also the largest known diamond to receive irradiation treatment, which improved its color. The Étoile du Désert, a 50.67 carats (10.134 g; 0.3575 oz), D-color, pear-shaped brilliant. Acquired by Winston in 1977 and mounted in a diamond necklace. Sold the same year to a Saudi Arabian prince. The necklace contained over 250 carats (50 g; 1.8 oz) of diamonds, among them a 16 carats (3.2 g; 0.11 oz) D-color Flawless clarity marquise cut. The Graff Pink of 24.78 carats, graded Fancy Intense Pink colour and with a November 2010 Sotheby's auction pre-sale estimate price of US $27 million to US $38 million (£17 million to £24 million). Sotheby's sold the rare pink diamond ring for $46.16 million to London jeweler Laurence Graff. The Hope, a 45.52 carats (9.104 g; 0.3211 oz), Fancy Dark Grayish-Blue, antique cushion brilliant. He bought this diamond in 1949 and later donated it to Smithsonian in 1958. He sent the diamond to the museum via a registered first-class mail. The package in which he sent the Hope diamond is found among the Smithsonian's collection. The Idol's Eye, a 70.20 carats (14.040 g; 0.4952 oz), Light Blue, semi-triangular modified antique brilliant. Allegedly first seen in 1607 when the East India Company seized the stone from its owner, a Persian prince named Ragab, as payment for debts. Resurfaced in 1906 in the possession of Sultan Abdul Hamid II. The stone, along with the Hope Diamond and Star of the East, were stolen from the sultan by his messenger and sold to French pawn shops. The stones were intended to provide a comfortable retirement for the sultan. Appeared at the June 1909 auction held in Paris by gem dealer and collector Selim Habib, where it was purchased by a Spanish nobleman. It then came into the possession of a London bank and eventually was bought by a Dutch diamond dealer, from whom Winston purchased the stone in November 1946. Winston sold the diamond in 1947 to May Bonfils Stanton, daughter of the publisher and co-founder of The Denver Post. It was mounted as the center stone in a diamond necklace with eighty-six other diamonds totalling 35 carats (7.0 g; 0.25 oz). In 1963, after Bonfils Stanton's death, the gem was sold at auction in New York City. Renowned jeweler Lawrence Graff of London also owned the stone. The Indore Pears, 46.95 and 46.70 carats (9.390 and 9.340 g; 0.3312 and 0.3295 oz) but later recut to 44.62 and 44.18 carats (8.924 and 8.836 g; 0.3148 and 0.3117 oz) respectively, colorless, both pear-shaped antique brilliants. Originally owned by Maharaja Tukoji Rao III Holkar who was forced to abdicate due to a scandal in 1926. Despite his abdication he remained very wealthy and retained the diamonds. He married American Nancy Anne Miller in 1928 amid much international publicity. Miller converted to Hinduism and after marrying was known as Maharani Shamista Devi Holkar. Winston purchased the two diamonds in 1946 from the former maharaja and his wife, both of whom had worn the stones on many occasions. The gems were recut to 44.62 and 44.18 carats (8.924 and 8.836 g; 0.3148 and 0.3117 oz) and were featured as his 'Court of Jewels' exhibit. Winston sold the gems in 1953 to a client from Philadelphia and repurchased them in 1958. They were then sold to a New York client and were once again purchased in 1976 and sold to a member of a royal family. In 1981 and again in 1987, the two noted diamonds were sold at auction in Geneva. The Isadora Diamond, an 80 carats (16 g; 0.56 oz) yellow diamond worth $5–6 million, first worn by Whoopi Goldberg at the 74th Academy Awards, then later worn by Kate Hudson and Liliane Montevecchi in the 2003 film How to Lose a Guy in 10 Days. In the film, it's called the "Isadora Diamond", named after Isadora Duncan. The necklace was sold shortly after filming finished. The Jonker, twelve gems, the largest weighing 125.35 carats (25.070 g; 0.8843 oz), colorless, various shapes. Discovered as a 726 carats (145.2 g; 5.12 oz) rough crystal in January 1934 and purchased by Winston from the Diamond Producers Association in London in 1935. It was the first time a major diamond crystal was cleaved in the United States. The largest diamond, the Jonker I, was a 142.90 carats (28.580 g; 1.0081 oz) emerald cut, but it was recut in 1937 to 125.35 carats (25.070 g; 0.8843 oz) to give it a more oblong outline. Winston is said to have loved the stone and refused to sell it for many years, using it instead for display at various charitable exhibitions, set in a platinum necklace with 110 baguette-cut diamonds. He sold the gem in 1951 to King Farouk of Egypt, who went into exile the following year, taking the gem with him. It was unheard of until 1959 when it was rumored that Queen Ratna of Nepal had been seen wearing it. It was later confirmed that Farouk did indeed sell the diamond to Nepal for a reported price of $100,000. It was later sold in 1974 at a Hong Kong auction for $4 million. A marquise shape and ten emerald cuts comprise the other diamonds cut from the crystal, the larger gems included emerald cuts of 41.30 (known as the Jonker II), 35.45 (Jonker III), 30.70 (Jonker IV), 25.66 (Jonker V) and 24.41 (Jonker VI) carats. Jonkers IV and VI were sold to American clients while the other three were sold to Indian maharajas. The smallest Jonker satellite stone, Jonker XII, a 5.30 carats (1.060 g; 0.0374 oz) emerald cut, was auctioned in New York in October 1975. The Lesotho, eighteen different diamonds, pale brown, various shapes. The diamond was discovered by Ernestine Ramaboa in May 1967 at the Letseng-la-Terai diggings in Lesotho. The crystal was sold at auction in Maseru to a South African dealer who then sold it to a European dealer. It was later purchased in Geneva by Winston. In 1969, he had it cut into eighteen stones totalling 242.50 carats (48.500 g; 1.7108 oz). The largest three gems were a 71.73 carats (14.346 g; 0.5060 oz) emerald-cut, a 60.67 carats (12.134 g; 0.4280 oz) emerald cut, and a 40.42 carats (8.084 g; 0.2852 oz) marquise brilliant, named Lesotho I, II and III, respectively. The 40 carats (8.0 g; 0.28 oz) marquise was bought by Aristotle Onassis for his wife, Jacqueline Kennedy Onassis. The gem was sold at her estate sale auction for over $2 million. The Liberator, four gems weighing 38.88, 18.12, 8.93 and 1.44 carats (7.776, 3.624, 1.786 and 0.288 g; 0.2743, 0.1278, 0.0630 and 0.0102 oz), D color, three emerald cuts and a marquise, respectively. Winston purchased the 155 carats (31.0 g; 1.09 oz) Venezuelan crystal in 1943 and cut four stones from it. The three smaller gems were set in a clip and the largest was mounted in a ring and sold to the forementioned Mrs. May Bonfils Stanton, in 1946. In 1962 Winston reacquired the diamond from Mrs. Stanton's estate and had it recut from its original weight of 39.80 carats (7.960 g; 0.2808 oz) down to 38.88 carats (7.776 g; 0.2743 oz). He sold it to an American client in 1966, who sold it at auction in New York on December 7, 1972. The Louis XIV, a 58.60 carats (11.720 g; 0.4134 oz), D color and Flawless clarity, antique pear-shaped brilliant. Reportedly the gem belonged to King Louis XIV of France but nothing of its history before Harry Winston bought it can be verified. Winston purchased the diamond in 1958 from the estate of Chrysler heiress Thelma Chrysler Foy. He then had it recut from 62.00 carats (12.400 g; 0.4374 oz) down to a flawless 58.60 carats (11.720 g; 0.4134 oz). He also obtained a 151 carats (30.2 g; 1.07 oz) oval sapphire from the Foy estate. In 1959 the diamond was mounted as the center stone in a tiara that also contained six smaller pear-shaped diamonds totalling 22 carats (4.4 g; 0.16 oz), and 233 smaller diamonds totalling 120 carats (24 g; 0.85 oz). The diamond was exhibited at the Louvre in 1962, along with the Hope Diamond, as part of the Ten Centuries of French Jewelry exhibition. In 1963 it was removed from the tiara and sold together with the 61.80 carats (12.360 g; 0.4360 oz) Winston Diamond to Mrs. Eleanor Loder of Canada, who wore the two stones in a pair of earrings. The Louis XIV was sold again in Geneva in 1981 from Mrs. Loder's estate. The Mabel Boll, a 44.76 carats (8.952 g; 0.3158 oz), near colorless, elongated emerald-cut. The diamond originally weighed 46.57 carats (9.314 g; 0.3285 oz) and was owned by Mabel Boll, the much-married American socialite whose name was often in the news in the 1920s. Boll collected nicknames like she collected jewelry: in 1921 she was hailed by newspapers as "Broadway's most beautiful blonde." She married Colombian coffee king Hernando Rocha in 1922, who presented her with a million dollars' worth of jewelry, mostly in the form of diamonds. The press referred to her as the "$250,000-a-day bride." She gained her most last nickname, "Queen of Diamonds", because she often appeared in public wearing all her jewelry. It was said that the rings she wore on her left hand alone were worth more than $400,000, which would equate to at least $4 or $5 million in today's dollars. When she died in 1949 Winston purchased the large emerald-cut diamond. According to Boll, the stone had originally been bought from Tiffany & Co. Winston slightly recut the stone, which measured 1⅜ by ⅝ inches, reducing it to 45.67 carats (9.134 g; 0.3222 oz) and set it in a ring. It was then featured in his Court of Jewels exhibition before being sold to a New York client in 1954. When the client died in 1965, Winston reacquired the diamond to a flawless 44.76 carats (8.952 g; 0.3158 oz), and sold it the following year to a European client. At this time it was designed to be worn as a ring or as the center stone to a bracelet set with an addition 112 smaller emerald-cut diamonds totalling 65.96 carats (13.192 g; 0.4653 oz). The McLean Diamond, a 31.26 carats (6.252 g; 0.2205 oz), blue-white colorless, antique cushion brilliant. The diamond was purchased by Harry Winston from the estate of Evalyn Walsh McLean along with other pieces of jewelry including the Hope Diamond and the Star of the East. He sold the McLean Diamond to the Duke and Duchess of Windsor in 1950. The Duchess, a collector of jewelry, wore the stone often and owned it until her death in 1986. It was sold at her estate sale auction in April 1987 for $3.15 million. The Nassak, a 43.38 carats (8.676 g; 0.3060 oz), colorless, emerald cut. The Nassak has an Indian origin. It was originally a triangular 90 carats (18 g; 0.63 oz) Mogul-cut stone, similar in appearance to the Taj-I-Mah Diamond. The stone was supposedly set as the eye of an idol of the god Shiva. After the Third Anglo-Maratha War in 1817–18, the diamond was seized by the Governor-General, Lord Hastings, and became part of the loot taken from India. Named the Nassak, it was sent to England. It was purchased at auction by crown jewelers Rundell and Bridge in 1831 during a period of severe economic depression. They had the stone recut to 80.59 carats (16.118 g; 0.5685 oz) to give it greater brilliance, and in the process it became a triangular brilliant with lots of extra pavilion facets. In 1837, it was sold at auction to the Marquess of Westminster (he also bought the Arcots Diamonds and the King George IV Diamond at the same time). The Marquess mounted it in the hilt of his dress sword. The diamond remained in the Westminster family for nearly a century. In the 1920s, it was sold to a Parisian jeweler, who brought it to America in 1926 for display. The stone later returned to Paris where it was bought by Winston in 1940, who had the stone recut to its present flawless 43.38 carats (8.676 g; 0.3060 oz) emerald cut shape. He then sold it to a New York jewelry firm in 1942. Mrs. William B. Leeds of New York purchased the gem in 1944 and wore it in a ring. It was sold at auction in New York in 1970. Napoleon Diamond Necklace, various stones, colorless, antique cushion brilliants, pear-shaped antique cushion brilliants, briolette cuts. The forty-seven diamonds in this necklace weigh a total of 275 carats (55.0 g; 1.94 oz). Napoleon gave it to his wife, Empress Marie-Louise, a Habsburg princess, to celebrate the birth of their son in March 1811. When Marie-Louise died in 1847 the necklace passed to her nephew's wife, Archduchess Sophie. Sophie left it to her third son, Archduke Karl Ludwig, upon her death in 1872. Karl Ludwig's grandson, Franz Joseph II, Prince of Liechtenstein, sold the necklace to French collector in 1948. Harry Winston bought the piece in 1960 and sold it to Marjorie Merriweather Post two years later. Post willed the necklace to the Smithsonian Institution, which received it in 1973. The Nepal, a 79.41 carats (15.882 g; 0.5602 oz), colorless, pear-shaped antique brilliant. Not much is known about this gem. It is thought to be a Golconda diamond and was owned by Jang Bahadur, the Prime Minister of Nepal, in the late 19th century and remained in the hands of Nepalese royalty until the mid-20th century. Winston purchased the diamond from an Indian dealer in 1957. At this time he had it slightly recut from its original 79.50 carats (15.900 g; 0.5609 oz) weight. It was set in a pendant/brooch combination and was featured in an article on diamonds and gems in the April 1958 issue of National Geographic magazine and then exhibited at London's "Ageless Diamond" exhibition the following year. That same year, the stone was sold to the Family Perfillon-Bertarelli as the pendant to a v-shaped diamond necklace that also contained 145 round brilliants weighing a total of 71.44 carats (14.288 g; 0.5040 oz). The Niarchos, a 128.25 carats (25.650 g), D color and Flawless clarity, pear-shaped brilliant. The gem was discovered as a 427 carats (85.4 g; 3.01 oz) crystal at the Premier Mine in South Africa, in 1954. In 1956, it was sold to Winston as part of an $8.4 million parcel. The largest gem cut from it was a 128.25 carats (25.650 g; 0.9048 oz) pear-shaped diamond. The same year it was purchased by Stavros Niarchos, Greek shipbuilder and industrialist, whose name it currently bears. Also cut from the rough were a 27.62 carats (5.524 g; 0.1949 oz) marquise and a 40 carats (8.0 g; 0.28 oz) emerald cut. They were also purchased by Niarchos. The Oppenheimer, a 253.70 carats (50.740 g; 1.7898 oz), light yellow, uncut crystal. The Oppenheimer was discovered in 1964 at the Dutoitspan Mine near Kimberley, South Africa. The stone is noted for being extraordinarily well-formed. Winston purchased the gem the same year it was found and donated it to the Smithsonian Institution in memory of Sir Ernest Oppenheimer, chairman of the board of De Beers Consolidated Mines Ltd from 1929 until 1957. The Porter Rhodes, a 53 carats (10.6 g; 0.37 oz), colorless, Asscher cut. The Portuguese, a 127.01 carats (25.402 g; 0.8960 oz), faint yellow with strong blue fluorescence, antique emerald cut. The Qamar-I-Sultana, a 44 carats (8.8 g; 0.31 oz), colorless, marquise cut. Queen Marie of Roumania sapphire, a 478.68 carat cushion cut from Sri Lanka. Set and reset by Cartier in the early 1900s, it forms a drop pendant. When sold in 2003, it was the largest sapphire ever sold at auction. The Vargas diamond, a 726.6 carats (145.32 g; 5.126 oz) uncut diamond which was later cut into 29 stones under Harry's direction. 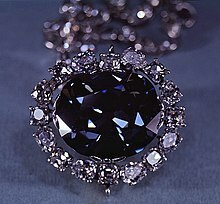 ^ a b "The Hope Diamond". www.si.edu. Smithsonian Institution. Retrieved December 2, 2015. ^ a b "Portuguese Diamond". www.mnh.si.edu. Smithsonian Institution. Retrieved December 2, 2015. ^ "Company Overview of Harry Winston, Inc". www.bloomberg.com. Retrieved 2019-03-24. ^ "Harry Winston - Swatch Group". www.swatchgroup.com. Retrieved 2019-03-24. ^ "Three of a Kind: Larger-than-Life Diamonds". Sotheby's. Retrieved 2019-03-24. ^ "5 minutes with… A Harry Winston wreath necklace | Christie's". www.christies.com. Retrieved 2019-03-24. ^ "Heritage, history and Mr Harry Winston". The Telegraph. 2016-11-17. ISSN 0307-1235. Retrieved 2019-03-24. ^ Meers, Carolyn (2017-12-08). "Harry Winston Unveils Revamped Flagship in Beverly Hills". Robb Report. Retrieved 2019-03-24. ^ a b Diaz Dennis, Alicia (December 11, 2008). "Fashion Influential #28: Harry Winston". www.zimbio.com. Zimbio. Retrieved December 2, 2015. ^ "Harry Winston – History". www.hautehorlogerie.org. Fondation de la Haute Horlogerie. Retrieved December 2, 2015. ^ "Harry Winston Unveils New 'Belle' Engagement Ring". www.forbes.com. Forbes. Retrieved December 2, 2015. ^ "Harry Winston and the bridal Belle". www.thejewelleryeditor.com. The Jewellery Editor. June 26, 2012. Retrieved December 2, 2015. ^ Burleigh, Nina. "The Trouble with Harry Winston". www.nymag.com. New York. Retrieved December 2, 2015. ^ Pristin, Terry (December 22, 2000). "New Partners Hope to Expand Harry Winston". www.nytimes.com. The New York Times. Retrieved December 2, 2015. ^ "Diamond deal: Swatch swoops for Harry Winston". www.standard.co.uk. Evening Standard. January 14, 2013. Retrieved December 2, 2015. ^ Ward, Kate; Jordan, Tina (December 23, 2008). "Books: 5 worst of 2008". www.ew.com. Entertainment Weekly. Retrieved December 2, 2015. ^ "Locate a Harry Winston Salon or a retail affiliate". www.harrywinston.com. Harry Winston Inc. Retrieved December 2, 2015. ^ Cohen, Tamara (October 25, 2010). "£24million pink panther: Rare diamond set to fetch record price". London: Daily Mail. Retrieved October 26, 2010. ^ Lee, Sally (2017). The National Museum of Natural History. Capstone. ISBN 9781515780076. ^ "Oscar Jewels: Where Are They Now?". People. March 15, 2004. Retrieved July 30, 2014. ^ Marc S. Malkin; Deborah Schoeneman. "Model Home Gets a Makeover". New York Magazine; New York Media. Retrieved July 30, 2014. ^ "Lot 382: A MAGNIFICENT AND HISTORIC SAPPHIRE PENDANT, BY CARTIER". Christie’s. Geneva, Switzerland: Christie’s. 19 November 2003. Retrieved 7 August 2017. ^ "CUTTING IS STARTED ON VARGAS DIAMOND". The New York Times. April 10, 1941. Retrieved December 7, 2011. Gregory, Alexis (1999). Harry Winston: Rare Jewels of the World. Universe Publishing. ISBN 0-7893-0326-4. Wikimedia Commons has media related to Harry Winston. The Hope Diamond is one of the most famous jewels in the world, with ownership records dating back almost four centuries. Its much-admired rare blue color is due to trace amounts of boron atoms. Weighing 45.52 carats, its exceptional size has revealed new findings about the formation of gemstones. Diamond cutting is the practice of changing a diamond from a rough stone into a faceted gem. Cutting diamond requires specialized knowledge, tools, equipment, and techniques because of its extreme difficulty. The Gemological Institute of America, or GIA, is a nonprofit institute dedicated to research and education in the field of gemology and the jewelry arts. Founded in 1931, GIA's mission is to protect all buyers and sellers of gemstones by setting and maintaining the standards used to evaluate gemstone quality. The institute does so through research, gem identification and diamond grading services and a variety of educational programs. Through its world-renowned library and subject experts, GIA acts as a resource of gem and jewelry information for the trade, the public and worldwide media outlets. The Chalk Emerald is a 37.82 carats (7.564 g) Colombian emerald. The Tiffany Yellow Diamond is one of the largest yellow diamonds ever discovered; its carat weight is 287.42 carats in the rough when discovered in 1878 in the Kimberley mine in South Africa, and was cut into a cushion shape of 128.54 carats with 82 facets—24 more than a traditional round brilliant—to maximize its brilliance. The facet pattern features eight needle-like facets pointing outward from the culet (bottom) facet. Jewelry and diamond historian Herbert Tillander refers to this as a 'stellar brilliant cut', and lists the gem in his book "Diamond Cuts in Historic Jewelry - 1381 to 1910" (1995) among other such diamonds: The Cullinan Diamond, The Koh-I-Noor, the Polar Star, the Wittelsbach, among others. The Nassak Diamond is a large, 43.38 carats (8.676 g) diamond that originated as a larger 89 carat diamond in the 15th century in India. Found in Golconda mines of Kollur and originally cut in India, the diamond was the adornment in the Trimbakeshwar Shiva Temple, near Nashik, in the state of Maharashtra, India from at least 1500 to 1817. The British East India Company captured the diamond through the Third Anglo-Maratha War and sold it to British jewellers Rundell and Bridge in 1818. Rundell and Bridge recut the diamond in 1818, after which it made its way into the handle of the 1st Marquess of Westminster's dress sword. The Wittelsbach-Graff Diamond is a 31.06-carat (6.212 g) deep-blue diamond with internally flawless clarity. Laurence Graff purchased the Wittelsbach Diamond in 2008 for £16.4 million. In 2010, Graff revealed he had had the diamond cut by three diamond cutters to remove flaws. The diamond was now more than 4 carats (800 mg) lighter and was renamed the Wittelsbach-Graff Diamond. There is controversy, as critics claim the recutting has so altered the diamond as to make it unrecognisable, compromising its historical integrity. The 968.9-carat (193.78 g) Star of Sierra Leone diamond was discovered by miners on February 14, 1972, in the Diminco alluvial mines in the Koidu area of Sierra Leone. It ranks as the fourth-largest gem-quality diamond and the largest alluvial diamond ever discovered. Mouawad is a privately held Swiss and Emirati luxury goods, vertically integrated company that makes High Jewelry, and retail company that sources diamonds and gemstones, designs, manufacturers, and sells jewelry collections, objects of art, and luxury watches. The firm has headquarters in Geneva, Switzerland, with a Middle East headquarters at Jumeirah Lakes Towers in Dubai. Founded in 1891 in Beirut, Lebanon by David Mouawad, the firm is now led by 4th generation co-guardians Fred Mouawad, Alain Mouawad and Pascal Mouawad. The firm's jewelry and watch design and manufacturing divisions are located in Switzerland and Asia Pacific. Lesedi La Rona, formerly known in media as Karowe AK6 or as Quad 1 by the personnel at the mine, is the third-largest diamond ever found, and the second-largest of gem quality. Only the non-gem black Sergio and the gem-quality Cullinan were larger. It was found in the Karowe mine, in Botswana on 16 November 2015. The "Star of the East" is a 94.80-carat, pear-shaped, D-color stone of unknown clarity grade. Its exact origin is unknown, but it likely originated from India. The origin of its name and year of discovery are also unknown. The diamond was part of the collection of the jewelry-loving Sultan of the Ottoman Empire, Abdul Hamid II. It later made it into the hands of Pierre Cartier, who sold it to Evalyn Walsh McLean. After Mclean's death, Harry Winston purchased the diamond together with Mclean's entire collection. The diamond's current whereabouts are unknown. Black, Starr & Frost is an American jewelry company. Founded in 1810, the company is the oldest continuously operating jewelry firm in the United States.